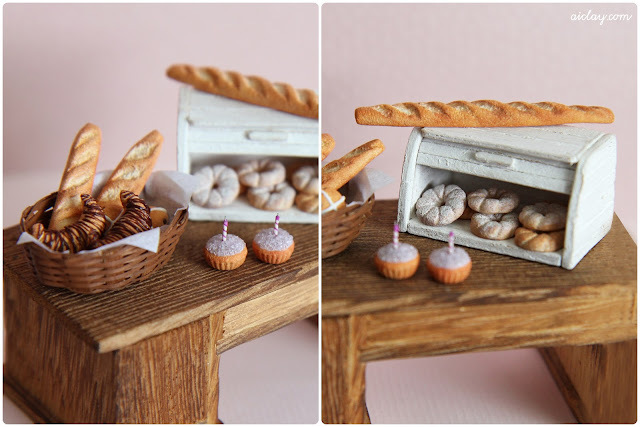 AiClay - a Haven of Miniature Food: The Straits Times Interview - best new year's present! The Straits Times Interview - best new year's present! Wow what a week it has been. Ever since the newspaper article was published, emails about workshops and commissions have been streaming in madly, much to my surprise (and delight!). I've never been much of a newspaper reader, so I must have forgotten about the reach of traditional media because I was definitely not expecting the attention I received. Also a shout out to all my online and offline friends and family who congratulated me upon seeing my fat face in the papers, you guys are wonderful and made me feel really special on that day, it almost felt like my birthday! Now that I've cleared all the mails and sold out all the cookie rings (yes you read that right! haha, but they're still available for pre-order), I can't wait to get back on track with the sculpting, fulfilling old commissions and working on new ones. It has been so long since I shared a photo of my works, so here's one taken of a part of the set-up that I put together for the newspaper photoshoot. If you look closely at the photo of me in the papers, you will see the little table as well. For everyone who has been patiently waiting for workshop updates, please bear with me while I try and get everything sorted! I already have your emails on the list of interested workshop participants, and would be sending out more information to you once I have them. Beautiful baked goods you'd made! Especially the long loaves of Baguette! Blessed week to you ahead!